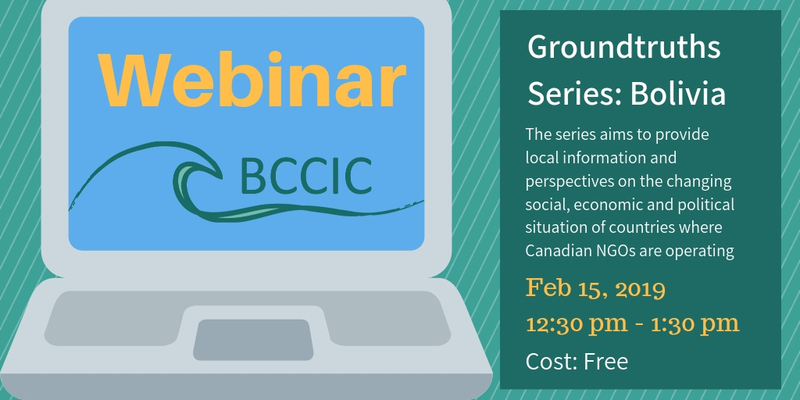 BCCIC’s “Groundtruths” webinar series provides on the ground information from the country partners of BCCIC members and affiliated organizations from around the world. The series aims to provide local information and perspectives on the changing social, economic and political situation of countries where Canadian NGOs are operating so that organizations can better understand how to partner, operate and support the work taking place. This month, we will be hearing an on the ground perspective from Bolivia and a sense of how the enduring government of Evo Morales is affecting social stability and political freedom in the country. An local expert in economic development will be sharing his perspective as a Bolivian national, NGO professional, and researcher and will share the emerging issues, challenges and opportunities that Bolivian society is facing and how these changes are affecting the role of NGOs and their ability and freedom to operate in the country. The webinar can be accessed online by registering through the link below and the webinar presentation will be followed by online Q&A for those who would like to learn more or share their own experience working in Bolivia. We look forward to seeing you online on February 15th.